I’ve spent the week walking round with the internally commissioned external report into LB’s death in my bag. All 115 pages of it. The saddest of saddest times. Since receiving the report there have been so many moments where I’ve wanted to pull it out, wave it under people’s noses. And say “Look. Look at this. Look at what’s written here…” On the bus, in meetings, with friends, in the street, at work, at home. A horrible, raging inability to make any sense of the incomprehensible. Combined with a desire to make this incomprehensibility more social. To find a way of making it understandable. I can’t do this of course. The report is confidential. If you didn’t know. And staff names have been redacted. 1. Very sorry to hear about LB’s death (six months on). Please accept my condolences. 2. Report enclosed. Appreciate reading this report will be difficult. 3. Names of staff have been redacted. Duty of confidentiality as an employer. Action will be taken as necessary in accordance with appropriate Trust policy. 4. You can discuss report and redaction of names at meeting with Southern Health/investigators on 23.1.14. 5. Report is confidential. Don’t disclose content. If you’d read the report, you’d probably wonder (as we have) how anyone could write such a covering letter, focusing largely on staff protection and confidentiality. And how the person (legal team) who wrote this letter could continue to chuck out such meaningless statements as “in accordance with appropriate Trust policy”. Was there no “duty to keep patients alive as a healthcare provider”? Does anyone at Southern Health (the CCG, Oxfordshire local authority/social care, Adult Safeguarding Board and wider…and yes, you are all implicated) have any understanding of what it must be like to leave your child in the care of a specialist NHS hospital and for him to die? I learned on Monday night that research into the views of the ‘Winterbourne View families’ found that they felt they were the only ones who actually cared about their children. There is little evidence that LB was cared for/about in the unit, or that anyone involved has given a toss since. Other than about reputations of course. It’s been process and procedure all the way. Most obviously led by the “Southern Health Manual of Muppet Rules and Policy”. There’s a lot of interest – media and otherwise – in the content of this ‘confidential report with the names redacted’. We postponed the meeting planned for today with Southern Health and the investigation team because, having read the report, we’d like our solicitor to be present. The meeting is re-scheduled for next Thursday. We can’t imagine this meeting. How to even think about bridging the gulf between our grief, heartbreak and intense pain, and the relentless and dogged efforts of Southern Health to protect their reputation and their staff. The only point to the meeting we can see is to thrash out the ‘confidential’ status of the report. The investigation has pretty much done what it says on the tin. Uncovering how a largely fit and healthy young man with diagnoses of epilepsy and learning disabilities could drown. In a hospital unit with five patients and a minimum of four staff. A hospital that subsequently closed following a damning CQC inspection. It really ain’t rocket science. The content of this report should be in the public domain. It’s a matter of public interest. How could it not be? 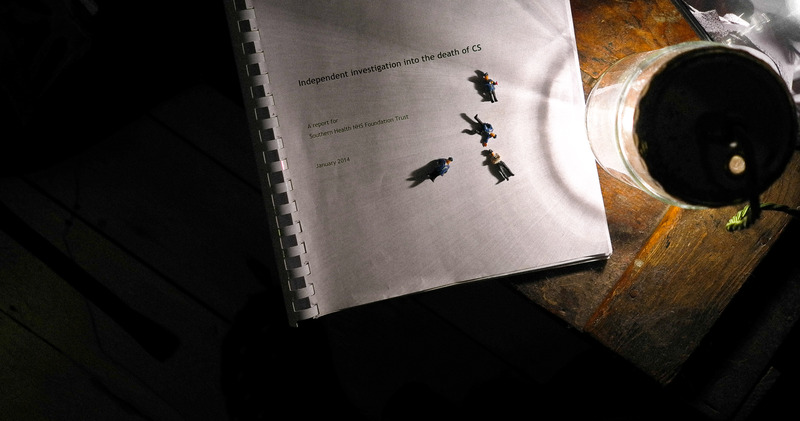 The death of a young man in an assessment and treatment unit two years after the uncovering of the Winterbourne View abuse demands public scrutiny. The death by indifference campaign can’t continually be swatted away. This is off the scale of unacceptable. Oh, and while we’re on the subject of unacceptable, another Southern Health learning disability/mental health unit has got enforcement notices from the CQC this week. This entry was posted in Laughing boy tales by sarasiobhan. Bookmark the permalink. Glad you postponed the meeting – you shouldn’t feel badgered into it. The notion of trust policies can just feck off – is there no trust policy to keep people alive? To show dignity, respect and compassion at all times. Hope you get something out of next weeks meeting, and in a heart breaking way I look forward to reading the report in due course….as witness to LB’s life, not for the pleasure obviously. Trust it will reach the public domain in due course? Seems to me that the contents of the report are in the public interest. What if it was disclosed? In the private sector, if someone designs a car for example, and that car turns out to have a fault and someone dies as a result, the designer could go to jail. I’m not sure I see a big difference. Exactly. No difference really. If you don’t do your job properly and someone comes to harm, they should be accountable. Regardless of the setting. Up against a Trust from the dark ages. Clearly. Surely you are allowed staff names – if not then justice can not be served or be seen to be served. If staff were at direct fault you should be able to report them to professional bodies but you can’t do this without names! I agree Pat, although it’s obvious who everyone is. Nonsense and unnecessarily causing additional layers of stress. Nothing like transparency and openness. Thanks Polly. We got the answers we knew really, but at least we didn’t get alternative ‘answers’ which is a bit of a relief. I completely agree with you. I can not imagine how hard this must all be for you yet through your blog you show an amazing resilience of spirit and courage. Thanks Kate. Needs must and all that. I dont understand why it cannot be made public. Can they really hide behind a bogus, one sided confidentiality clause? I notice they are not giving LB the dignity of his name on the report either – he is reduced to a two-letter acronym. Why? It is not like his name is not already in the public domain. It seems to me to be another signifier of the service commissioners’/providers’ view of him as a non-person: to be kept nameless, faceless, voiceless, to justify treating him as worthless. It must be costing you so much to stay strong for him. Win and make them hang their sorry heads in shame.